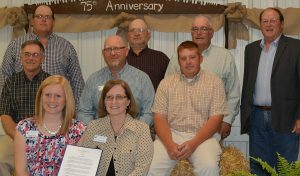 The Highland County Commissioners presented a proclamation to the Highland Soil and Water Conservation District supervisors and staff in recognition of the district’s 75th anniversary. The county was the first to formally organize a conservation district in Ohio. 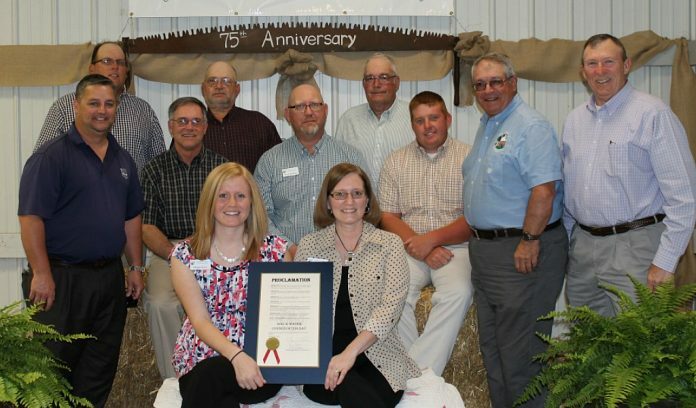 Pictured (front, L-R) are: Megan Scott, district resource specialist, and Pam Bushelman, district operations manager; (middle, L-R) Commissioner Shane Wilkin; Jeff Boike, supervisor; Chuck Williams, district technician; Kyle Mustard, supervisor; Commissioners Jeff Duncan and Terry Britton; (back, L-R) supervisors Jim Carr, Dan Chambers and Larry Shannon. HILLSBORO, Ohio — The Highland Soil and Water Conservation District (SWCD) and the Highland County Historical Society hosted a celebration April 18 to commemorate the 75th anniversary of the Highland SWCD and the 60th anniversary of the World Plowing Match. Former Ohio Division of Soil and Water Conservation Chief, Larry Vance, was the featured speaker. He detailed how the district was formed April 18, 1942 — the first conservation district in the state — and read the testimonials from locals as to why there was a need for the district. Past SWCD supervisors were also honored during the event. (Click to enlarge) Ohio Director of Agriculture Dave Daniels (standing, far right) presented a special 75th anniversary proclamation to the Highland SWCD on behalf of Ohio Gov. John Kasich. Also pictured during the April 18 event are: (seated, L-R) Megan Scott, district resource specialist, and Pam Bushelman, district operations manager; (middle, L-R) Jeff Boike, supervisor; Chuck Williams, district technician; Kyle Mustard, supervisor; (back, L-R) supervisors Jim Carr, Dan Chambers and Larry Shannon. The district received numerous proclamations in recognition of the anniversary, including those from the Highland County commissioners; Speaker Clifford A. Rosenberger of the Ohio House of Representatives; U.S. Rep. Brad Wenstrup and Ohio Gov. John Kasich. Guest speaker John Wickerham shared highlights of the 60th anniversary of the World Plowing Competition, which was held in Adams County in 1957. Highland County resident Duane Mootz was named the Contour Plowman Champion at the event. Historical memorabilia was displayed by the Highland SWCD, the Highland and Adams Historical Society, Southwestern Ohio Farm Toy Collector Club, the Highland County Antique Machinery Club, the Highland County Recycling and Litter Prevention and the Highland County Farm Bureau to focus on conservation awareness and the heritage of agriculture. Next articleIs a career in agriculture in your future?